If you love to brew tea or hot beverages, an electric water kettle comes in handy. Over the years, the stovetop kettle was the most popular. But, upon their inception, electric kettles have become great companions in most kitchens. However, if you have to use your gas stove any time you need boiled water, it can hike up your bills. Fortunately, the market has some affordable electric water kettles. These are designed to bring water to boil within a few minutes.They are made in different models, sizes, materials, and styles. This does not mean that you cannot find an electric kettle for your home. Do you need one for travel? What capacity do you require? These are some of the factors, which will guide your purchase. To help make your search a little bit easier, below are some reviews that will guide you in making an informed purchasing decision. The Secura 1.8 Quart Stainless Steel Cord offers you an everlasting solution for when you need a hot cup of coffee, tea or any other beverage. It has a stainless construction to last long. Besides, the electric kettle has a sleek design but can still hold about 1.8 quarts of drink – equivalent to 1.7 liters. Although the kettle is made of stainless steel, it does not have a scaling effect. 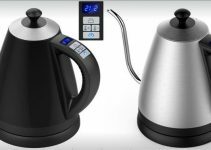 I can’t say this is the fastest boiling electric kettle, but he featuring a double-wall construction for quick and effective boiling. The kettle has a power rating of 1500W and it is ETL approved. With this electric kettle, you can make your favorite beverage at any time. The electric kettle is easy to use. It has a short cord, which you can choose to use or not to. The kettle heats up fast all thanks to the double wall. It can remain for a long time without being damaged due to the stainless construction. The stainless steel lid is a real bonus since most stainless steel electric kettles lack this feature. Owing to the materials used in building the double wall, it is heavier than other electric kettles in the same category. The on-off button is large and it loosely attached. It does not seem to last long. When you are looking for a lasting electric kettle, the Secura 1.8 Quart Stainless Steel is a great choice. It is built with stainless steel to provide the needed durability but also to enhance its efficiency. No plastics are present in this kettle. The only problem is its weight due to the double wall. 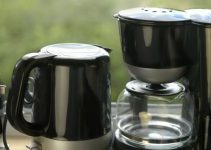 Brentwood has been known to produce a wide range of kitchen appliances from saucepans to coffee makers. Their Brentwood 1.2 Liter Stainless Steel Tea Kettle is a representation of their ingenious expertise. The electric kettle is cordless and it is built of stainless steel to accord it durability. The kettle also features a strong but a comfortable handle. In one boiling, the kettle carries about 1.2 liters. What’s more is the kettle has a stable base and a fitting lid to go with it. The kettle boils water very fast. It has an automatic shut off button, which improves its safety. The kettle does not have plastics in its interior. It pours tea or water smoothly. The kettle is durable, owing to the stainless steel body. It does not cost as much compared with other electric kettles in the market. The cord can be stored at the base when it is not in use. It does not carry huge capacity. If you have a large family, you might have to boil tea a few times to satisfy everybody. You can view the level of water from outside. The Brentwood 1.2 Liter Stainless Steel Tea Kettle Model KT-1770 is a great buy. It is made of stainless steel. It works fast and has an amazing design. However, it will not be easy to view the water from the outside. The Aroma AWK-103 Electric Water Kettle gives you the best boiling experience. Whether you are looking forward to a fast oatmeal, noodles or tea, this is one of the best electric water heaters and will not disappoint. In one turn, it can boil four cups. Do not worry about forgetting the kettle boiling, since it shuts off automatically once the water boils. The base and the main kettle can be detached for cordless serving. Its design is also amazing and the handle is comfortable to the touch. There is also a water-level window, which makes usage easier. It has a small size and a great design. You can use it at home, as well as when you travel. It is light. Hence, you can move it around. The electric kettle has a quiet operation. For safety purposes, the shut-off feature helps when the water boils. As compared to other electric water kettles, it does not boil as fast. It also lacks insulation. Hence, you will have to use the water immediately after heating it. The Aroma AWK-103 Electric Water Kettle is a great appliance. It heats up water within minutes. Owing to its small size, you can carry it to any place. Therefore, it is suitable for office use, in the bedroom or any other space. However, it does not have insulation. If you are looking for a glass electric kettle, the Ovente KG83B will never disappoint you. It is functional but does not also fail in looks. It will be a real centerpiece on your kitchen’s countertop. The Ovente KG83B Glass Electric Kettle carries 1.5 liters and uses about 1100W. It has been proven to have 85-percent efficiency as compared to the ordinary stovetop. Hence, it can trim your electricity usage significantly. The most interesting thing about this kettle is its corded base, which can be separated from the rest of the body when serving beverages. The kettle can be lifted from the base when serving. The hidden water-heating element prevents mineral accumulation. It heats fast – around 5 to 6 minutes. The lid flips back, to allow effective cleaning or filling. It features a glass casing on most of its exterior body. This makes it look lovely on the kitchen countertop. The glass covering is also durable and resistant to stains. It bears an ergonomic handle. For safety purposes, it shuts off automatically when the water or beverage is ready. It comes with 30-inch cord. It is long enough to work with around the kitchen and can be tucked into the base for easy storage. When one fills the kettle with water, steam tends to collect around the shut-off button. This prevents the auto feature from operating as it should. It is not as durable as stainless steel electric kettles. The Ovente KG83B Glass Electric Kettle, 1.5 Liter is a great electric kettle. It enables you to view the contents of the kettle, all thanks to the glass covering. It also heats up fast and the base can be separated from the main kettle. But the auto-shut off button may not last long. Due to his low price, this kettle can easily make apart from a cheap electric kettles category. The Ovente KP72W Cordless Electric Kettle is both functional and beautiful on the countertop. It is easy to use. The kettle holds 1.7 liters and runs on 1100W of power. It is more efficient than any other stovetop kettle you can get in the market. The kettle can be separated from the base to allow effective pouring without the cord. For safety, the lid locks securely, it shuts off when the water boils and indicates when the power is on. What more, it has a long cord, measuring about 30 inches. When not in use, simply store it at the base. It boils the water fast. In just 2 minutes, your water will be ready. The cord can be tucked in the base. When the water is boiling, the on/off feature works automatically. This ensures safety. It features a comfortable handle and one which does not heat up. It gives a signal of blue light when it is powered on. One can easily see the water level. It is convenient. When pouring the water, you can lift off the kettle from the base. The coil installed at the base tends to rust. It is made of plastic covering, which may not be as durable. The Ovente KP72W Cordless Electric Kettle offers great boiling experience. The electric water kettle boils water within minutes. To ensure safety, there is a blue light to indicate when it is on and when the water is ready, the kettle automatically shuts off. But the coil rusts with time. The Proctor Silex K2070YA Electric Kettle, I-Liter, uses an immersed element to bring your water to boil in just a span of minutes. The electric water kettle uses 1000W to ensure continuous and fast boiling. In addition, it features a detachable cord. It helps much when you are pouring out the boiled water. The kettle is also designed in a way that it does not spill water. It might interest you to know also that the kettle features two windows from which you can view the water level. It also has a lid which fits securely and a handle. The immersed heating coil boils the water rapidly. The detachable cord allows for convenient pouring. There is also a space at the base for storing the cord. The handle is comfortable and cool to touch, even when the electric kettle contains boiled water. When the water boils, the kettle stops automatically. The kettle has a small design which makes it a great choice for travelers. The first time the electric water kettle is used, it produces a plastic smell. It heats up on its walls. Hence, if you are not careful, you may burn your hands. The Proctor Silex K2070YA Electric Kettle is a popular water heater. It has a detachable cord and safety features including the auto-shutoff feature as well as the secure lid. But it releases a plastic smell when it is new and it also heats up on the outside. In this review, the best electric water kettle is the Secura 1.8 Quart Stainless Steel. It is made of stainless steel in its entire body, including the lid. Furthermore, it has a larger capacity of about 1.7 liters. The Brentwood 1.2 Liter Stainless Steel Tea Kettle Model KT-1770 comes second. While it only holds 1.2 liters, it is durable due to the stainless steel. However, it is difficult to view the water from outside. The Aroma AWK-103 Electric Water Kettle is third in this review. It has excellent features, including a detachable cord, auto shut-off function, water level windows and others. However, it does not have insulation, which makes the boiled water cool off fast. The fourth position is occupied by Ovente KG83B Glass Electric Kettle. It is made of glass and allows you to view its contents. Besides, it has the looks but it is not as durable as the other two electric kettles. The Ovente KP72W Cordless Electric Kettle comes fifth. It has a generous capacity of 1.7 liters. But the coil at the base does rust with time. The Proctor Silex K2070YA Electric Kettle is last in this listing. The kettle heats water fast and consistently. It can hold up to one liter of water. However, the first time you use it, the electric water kettle produces a plastic smell. If you have any thoughts about these reviews please leave a comment in the comment section below.